It’s a warm summer weekend in Turku, Finland. I just stepped off the VR train from Helsinki to check out Ruisrock. This is a swift, convenient, punctual train trip that I’ve never seen equaled in the U.S. – for some reason, we’re a nation that hasn’t grasped the benefits of high-speed rail travel. Now, it’s time to wander Turku. We have a good eight hours to kill before we head to Ruis Salo, the island that hosts Ruisrock. Today’s lineup ranges from Nightwish – the day’s headlining band and Finland’s best-known musical export – to Children of Bodom, Apocalyptica and The Cardigans. It’s a walkable city. The Aura River cuts through it, with pleasant walking paths lining the banks. Permanently moored boats turned into restaurants enhance the nautical vibe – this is a seagoing town. Some of the world’s largest cruise ships are built here. The Forum Marinum displays ships and other maritime memorabilia. It’s nearly closing time by the time we find the museum, so we don’t go in. 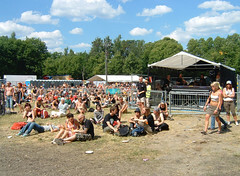 Planning our route to Ruisrock dictates our next move. We walk a few blocks to the central square, where buses leave every 15 minutes or so. We wander the farmer’s market and pick up some fresh fruit. One of my “visit Finland” goals is to taste an authentic sahti. I’ve had sahti-style beers – but not the real thing. We visit Panimoravintola Koulu, a brewpub set in a former school. A quick conversation first confuses then annoys the barkeeper – no sahti, and a focus more on lagers than ales. So off we go. We strike out in the sahti search at Alvar, too. A friendly Italian bartender and a better beer list keep us there. We grab a snack at a kebab shop. 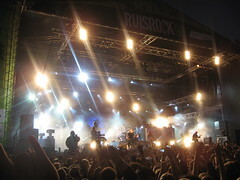 Then, off to Ruisrock. The bus deposits us just over the bridge. We walk more than a mile down a quiet, forested path. Our first impression at the gates – a chaotic mess. A campground, a sprawling bike parking area, a No Man’s Land of litter. But hey, it’s hard to wind people up, give them a sea of lager and expect everything to stay pristine. Inside is a huge compound with at least seven stages. My favorite is right on the beach. Between stages – kiosks hawk everything from food to souvenirs. There’s lots of mud free for the taking, especially near the watering stations. It’s a dusky midnight when Nightwish takes the stage. They play a short but energetic set, a mix of old, new and re-imagined (the slowed-down acoustic version of “Nemo” is quite a twist). The stage show with fireworks and gouts of purple flames shooting all over is a treat – far different from the stripped-down Nightwish shows I’ve seen in the U.S. Then the exit stampede begins. The path back to the buses is packed with people, but it still moves fast. Not so much the lines for the busses. I envy those who had bikes. My advice if you go to Ruisrock – find somewhere, anywhere, to rent a bike. You’ll be back in town before the bus crowd even boards. This is when the funniest part of the day begins – several Finns come up to me to say that I played great. I just nod and say thank you, not quite knowing what else to do. One particularly short and star-struck man pats me on both shoulders several times, giving me a wide-eyed stare and making an odd cooing noise before his friends lead him away. I still have no idea which musician I resembled. The next day, we walk around town a bit more, noticing yet again that Finland doesn’t rise early. We catch the VR train back to Helsinki. If you travel to Finland, spend more than a bare 24 hours in Turku. It’s warm, relaxed and fun enough to deserve a few days in your itinerary. Ibis Hotels offer a great night’s sleep for an even better price. Discover one of the cheapest Gatwick Airport hotels for business, family or stop-over accommodation. With modern rooms, comfortable beds and great service, enjoy a pleasant stay overnight at one of the best located Heathrow Airport Hotels, perfect for the travelling professional. At Ibis, breakfast is served from 4am for early birds, until 12pm for late risers. Whether you are staying at one of our Bristol hotels for leisure or in a London hotel for business, you can start the day in the right way. Do all cheap hotels in Leeds offer friendly and informative service? At Ibis, we are passionate about service, whatever the request and whenever you need it. We will be happy to help. You can find Ibis hotels in many of the larger towns and cities in the UK, from Glasgow Hotels to Plymouth hotels. Wherever you need to go, we offer a comfortable stay for an amazing price. Next Asia’s Novelty Act – Me!